We are very lucky to have an allotment – my Uncle has a huge field and his own allotment and has kindly donated each of us our own patch. 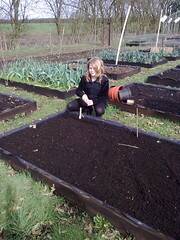 First job to prepare the bed and dig out the weeds.. Watched more Roman Mysteries and baked cookies. After lunch we picked up Star the dog and went for another walk round the village to the park – not much progress. 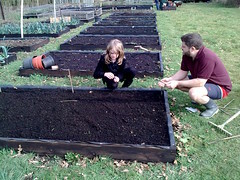 Discussed what we should grow in our allotment and how often we would need to look after it and what would need doing. Girls are very keen – especially as my Uncle has two child size ride on battery-powered vehicles stored there that they will be able to ride about on! Whilst Pops was busy writing, Skye and I played one of my old board games from when I was little – Staying Alive! It’s amazing what my Mum and Dad keep in their loft! Had a quick tea and took the girls to Mum and Dads for a sleepover! Thursday Sent the girls to their Nana and Papa’s with some maths questions and reading books and astonishingly they had completed the maths questions and did some reading!! Generally they struggle to do anything I send over so this is progress!! They went dog walking and popped into town and both came hope in a new outfit!! I came home from work to a lovely dinner, had a lovely chat about their day, tv, then bed. They had lunch with Nanny, did some reading and watched a movie. What a beautiful morning – such a contrast to the awful weather we have had over the last few weeks! We have spent the weekend watching the brook in front of our house slowly creep up to within inches of the top of the bank but fortunately it is now creeping back down again! Went to the cinema on Saturday morning, really wanted to see ‘Where the Wild Thing Are’ but unfortunately it was sold out so we went to watch ‘Up’ for the second time – but such a fantastic. It reminds both Wayne and I of us in some ways – we have been planning a ‘big trip’ for the last few years but there has always been something that has stopped us 😦 One day we’ll go – I think this film has made us more determined! 🙂 Popped to the library on the way home. Poppy had her friend over for the day and I baked a birthday cake for my friend. Later in the afternoon popped the cake round to S’s with her birthday present. Wayne was suffering with a headache so crashed out on the sofa for a couple of hours. Sunday was a horrible rainy day so spent most of the day doing a lot of nothing in particular – girls played with playmobil and on the wii. Went to Mum and Dad’s late afternoon and ended up stopping for tea. Monday didn’t manage to get to Merry’s as my car is poorly! However we had a lovely day – I think having the sun pouring in on us helped!! Both girls made cookies, did some maths, made gooey slime from their Horrible Science Book of Experiments that they took our of the library. We read a book about the Saxons together as we are hoping to visit the Saxon village at West Stow on Sunday. The ‘Roman Mysteries’ DVD arrived so Poppy and I watched the first two episodes – Poppy loved them! 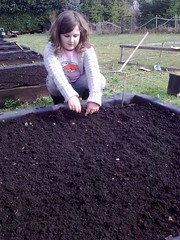 I thought at first she wasn’t enjoying it so when I asked her she replied ‘I’m just really concentrating – its fantastic!’. I think she would have watched the whole series but ideally want Skye to catch up so we can all watch it together. Tuesday the girls started off with some Maths – Skye looked at number patterns and her times tables. She took herself off to work on her own as Poppy likes to talk things through and she found it too distracting! I have no idea how she coped in a class of 33!! Poppy sat with me and did a little bit of fractions, times tables and long multiplication. Skye watched the first two episodes of Roman Mysteries and loved it too! All sat and watched the next two which were equally as popular – desperate to watch more! Had a quick lunch then went out for another walk in the glorious sunshine! Visited the park to see how things were coming along and they have now laid out all the equipment in its relevant space – will revisit tomorrow. This lovely weather has made me think – we really need to go up to our allotment – we are fortunate that my uncle owns a very large field with allotments and has given each of the girls and I our own patch. 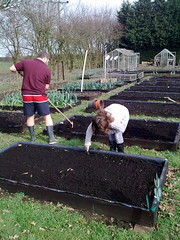 Unfortunately we didn’t find time to go last year with school and work commitments but this year we should be able to manage a couple of afternoons a week there – just need to find out what to plant and when!! 🙂 We get through so much fruit and veg so to grow our own would be fantastic! I had an opticians appointment this afternoon and was informed that I need to wear glasses for computer work!! Girls helped me choose some – I think I look odd in glasses but hopefully I’ll get used to them! Skye had another great drum session. With very little practice during the week she is very good – with practice she would be great! Still wants a drum kit for her birthday! My cousin has practice kit that he had made years ago that is gathering dust so he has said that Skye can borrow that – fortunately it’s has rubber pads so shouldn’t be too noisy!! Had a very rushed tea and dropped Skye off at Scouts earlier than usual as they are off to the swimming pool – they have a swimming gala on Saturday and tonight is their last practice! I went out with a couple of friends for a girly catch up and drink – got home at 12.30am!! Wayne struggles to know what we find to talk about for 4 hours! !